Suspended ceilings are a type of architectural design element used in commercial and residential buildings. They are created using metal grid systems, which are suspended below the ceiling or roof deck using a series of wires. The grid is then filled in with ceiling tiles, which are primarily made from mineral fiber blends. These ceilings provide easy access for maintenance, and come in a variety of styles to meet the needs of any builder. Exposed grid varieties are the most common type of suspended ceiling. They consist of long metal strips, called "mains," which are interconnected with shorter metal pieces known as "tees." Together, the mains and tees form a grid system of 2' by 2' or 2' by 4' squares, which are then filled with acoustical ceiling tiles. These exposed grid systems feature a standard 15/16" wide metal frame around each tile, though wider and narrower versions are also available. Concealed grid systems use the acoustical tiles to hide the grid system from view. This creates a smooth, clean look that many find to be aesthetically pleasing. The tile used in a concealed system has a small groove built into it's perimeter, which slides over the mains and tees to cover them. This type of system is more expensive than an exposed system, and can make it difficult for maintenance personnel to access areas above the ceiling. Bandraster systems are one of the most versatile types of suspended ceilings. They are comprised of metal tees and mains of varying lengths, which can be used to form a variety of patterns. 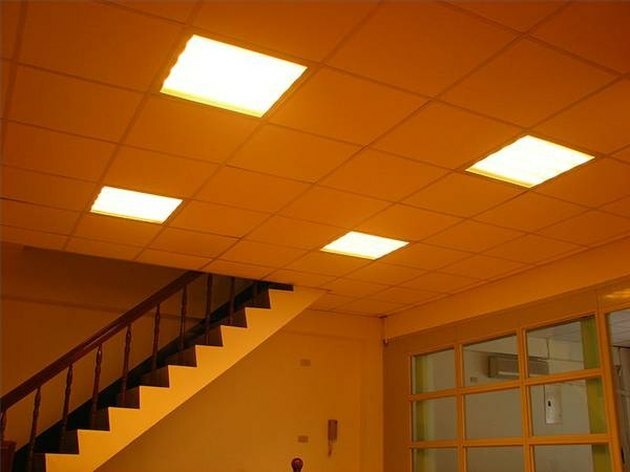 These systems are often used by building owners who want to create a certain look with their ceiling, as they can be arranged in many different ways. Bandraster ceilings require the use of specially-sized tile to fit within the unique grid patterns. Some suspended ceiling systems do not require the use of metal grid, and instead use wires and hangers to suspend sheets of drywall below the ceiling. These systems are an easier alternative to the extensive framing and hat channel that are typically required to create drywall arches or ceiling structures. Flat sheets of suspended drywall or panels may also be hung below ceiling level to provide acoustical or aesthetic benefits . There are a number of choices when it comes to choosing tile for suspended ceiling systems. Buyers can choose from tile that is highly textured, or perfectly smooth. While off-white tile is the most common, a number of other colors are available, as well as tiles printed with designs and patterns. In hospitals and clean room settings, mold and mildew resistant tile may be used. Finally, tile is often chosen for its level of acoustic absorption, especially in schools and other large commercial applications.